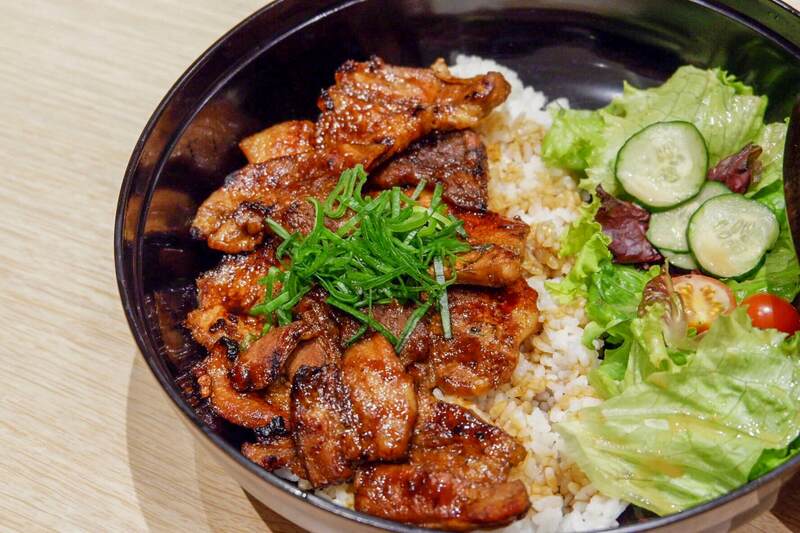 There’s just something about Japanese food that tickles the Filipino palate. 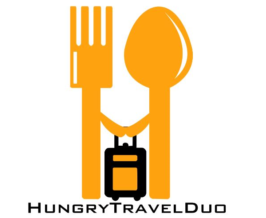 With so many “Japanese” restaurants out there, it seems setting up one is a surefire business idea! There’s only one catch, though. Most of the Japanese-style chains out there really have nothing Japanese aside from their names. 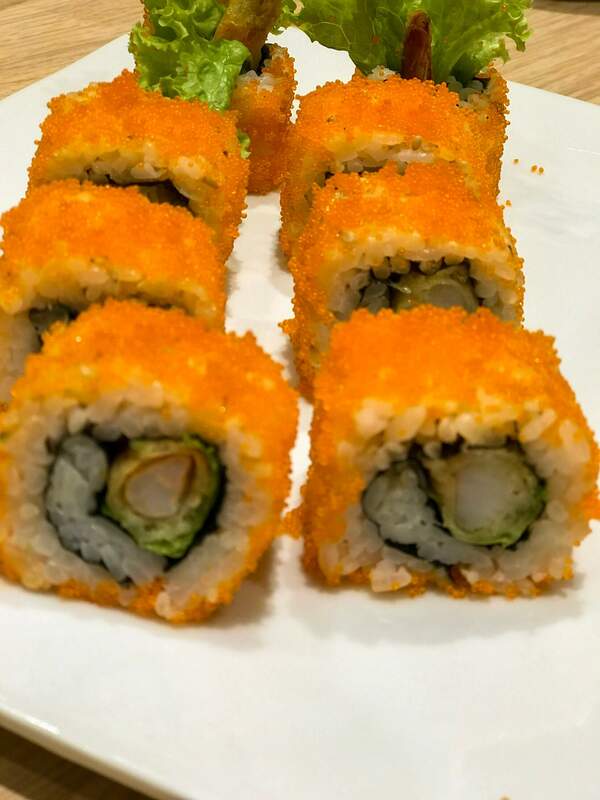 It takes something special to achieve that fresh, flavorful, and exotic Japanese taste that most just don’t care to work on. In fact, most of these chains taste more Western than anything! 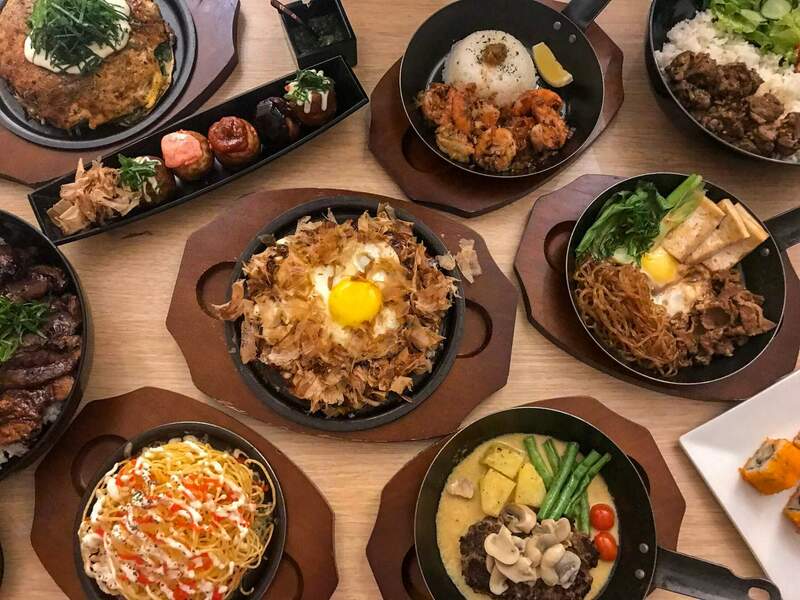 So if you’re in the Bagong Pag-asa area and have a hankering for something really Japanese, head over to the 4th floor of the Ayala Vertis North and look for Botejyu Teppanyaki Restaurant. Unlike many others in the field, Botejyu has a history reaching back to 1946, when it rose to popularity as a driving force behind the progress of Osaka’s gastronomic scene. 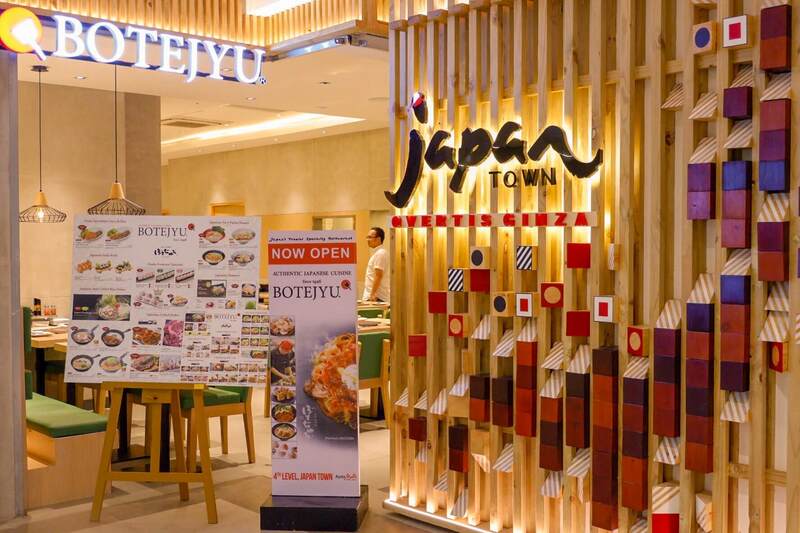 Now, Botejyu has taken root in many other parts of Asia, and is known all over for serving the best, authentic, okonomiyaki anywhere! In cooperation with VIVA International Food & Restaurants, we finally get to see what real okonomiyaki tastes like! And no, real okonomiyaki isn’t something that you order as an add-on or side-dish with your oil-soaked tempura. Making it is an art on its own, and that’s where Botejyu specializes in. At their invitation, we got to see that just like other forms of art, one who is masterful enough can pull off unusual ideas that would still work marvellously. 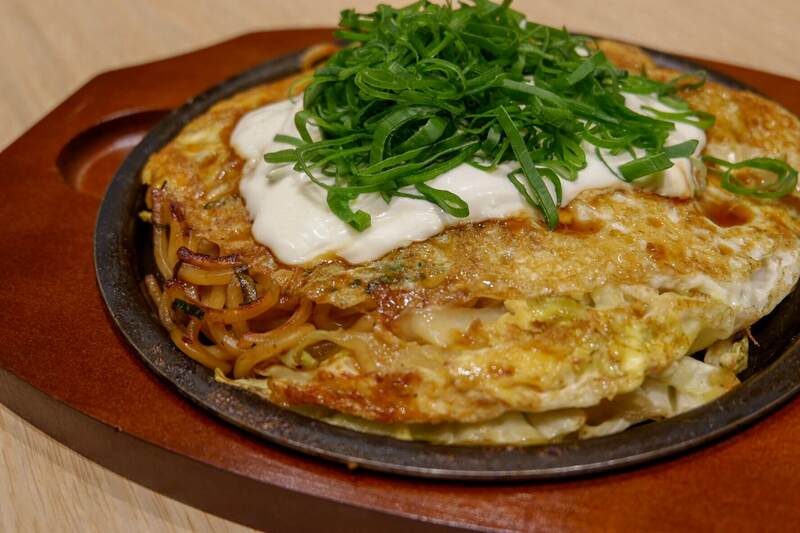 Such was Botejyu’s combining of yakisoba and okonomiyaki, their use of mayonnaise as flavoring, and their concept of the “modern” okonomiyaki: the “okosoba”. Of course, before that, we had a sampling of their other signature treats. First up was a platter of takoyaki, all garnished in various ways from the common mayo and spicy mayo to the more unusual garlic sauce, umami sauce, and tomato sauce. 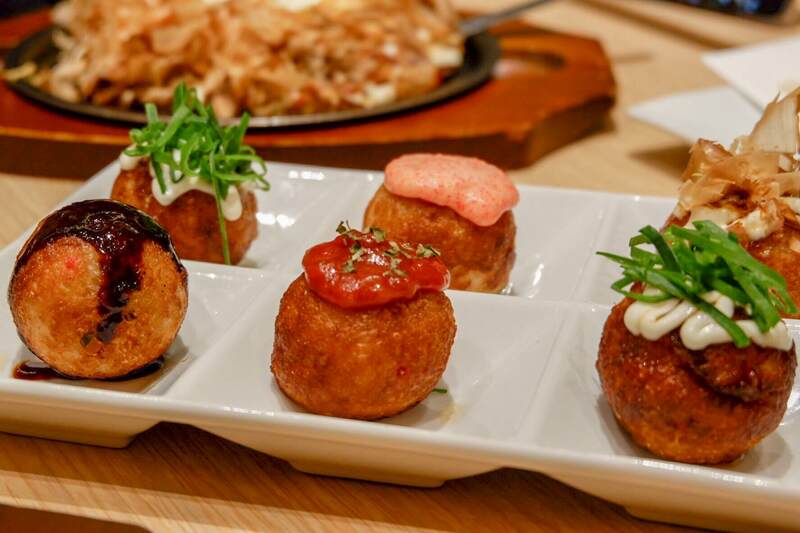 This version of the takoyaki is a far cry from those sold in mall stands. Yes, it is similarly light, though this lightness is not empty but highlighted by its savory ingredients. 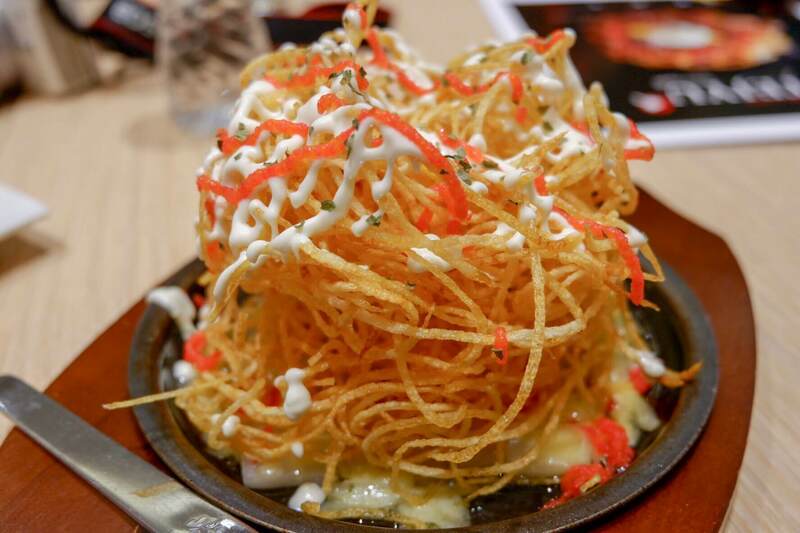 There is enough balance that you can appreciate the taste not just of the takoyaki itself but also the toppings. Up next is one of their many okonomiyaki versions, the “Premium Moonlight Okonomiyaki”. It’s an unusual combination of pork. beef, squid, shrimp, and fried egg, but the taste is oh-so-heavenly! 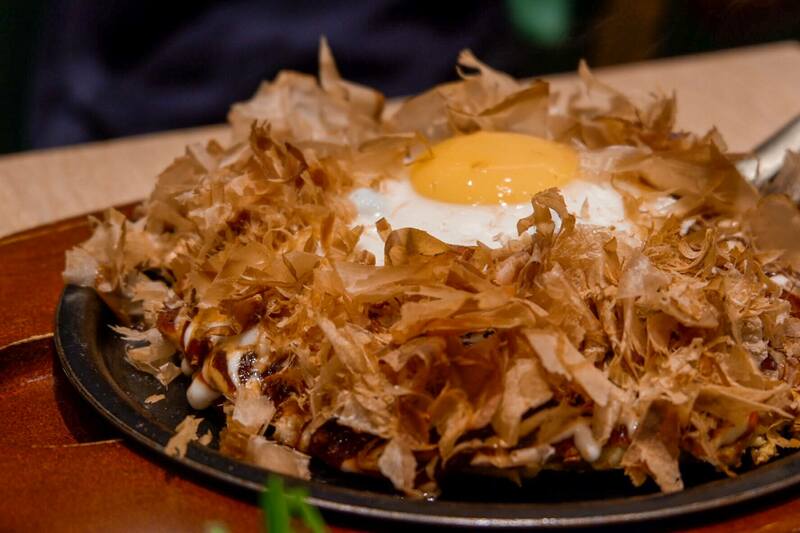 The “moonlight” in the name might be referring to the egg, but it may also refer to that celestial sensation you feel when the okonomiyaki hits your tongue. There’s also the Premium Okosoba, which is a delightful combination of the two famous Japanese merienda fare: yakisoba and okonomiyaki. The noodles are also seasoned with pork, beef, squid, and shrimp, and are made to be thick and deliciously tasty. Just one of this would definitely fill anyone’s appetite! We also had the Mentaiko and Potato Mochi Yaki, which as the name implies is made with mochi (not the ones that come in plastic wrappers) and crispy potato. It is flavored with cheese and a spicy sauce (Hakata spicy cod roe). While it looks like crispy noodles at first glance, this meal is a feast not just of flavor but also texture. It’s light and airy, crispy and chewy, spicy and savory, all in one! 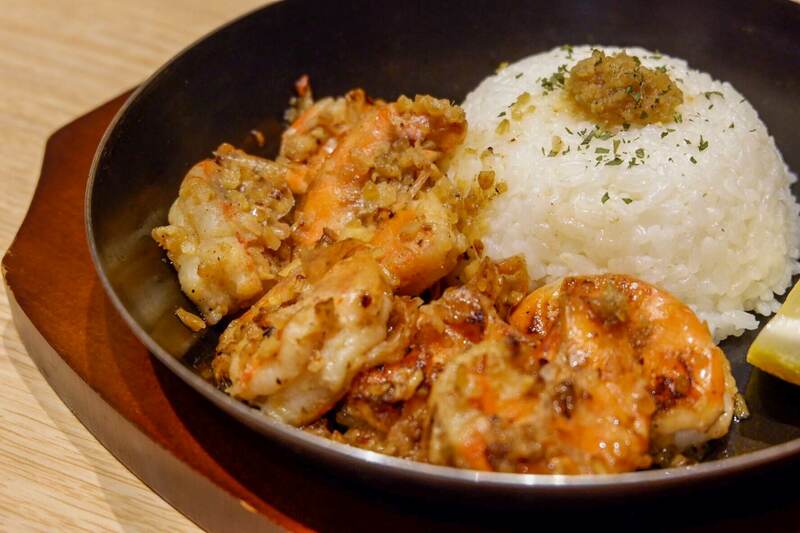 Of course, rice is something that both Japan and the Philippines share in their meals. It makes sense that Botejyu offers rice as part of its menu. 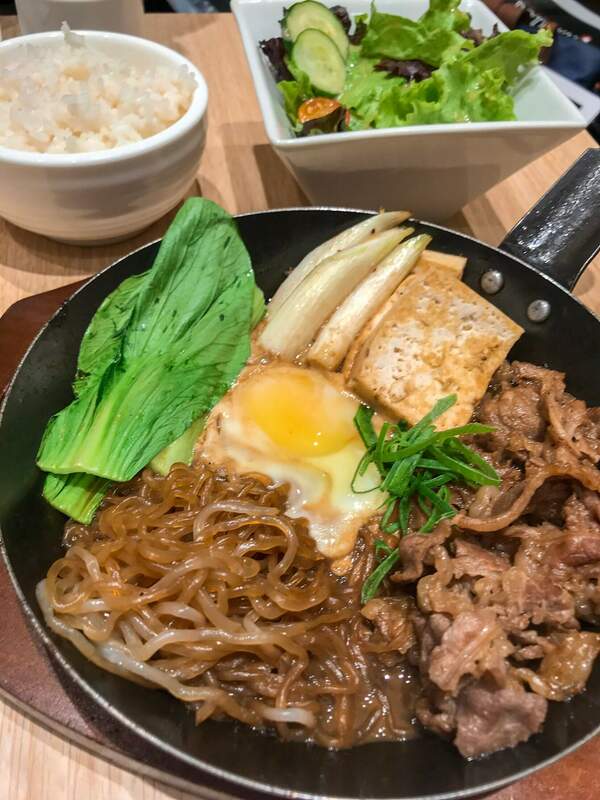 The Beef Sukiyaki Rice Set and the Amiyaki Grilled Pork Rice Bowl both elevate the humble rice into a part of a heavenly ensemble, guaranteed to whet your appetite just by looking at its pictures! The tender meat, savory sauces, and perfectly balanced flavors would make you want to eat again and again, diet be damned. 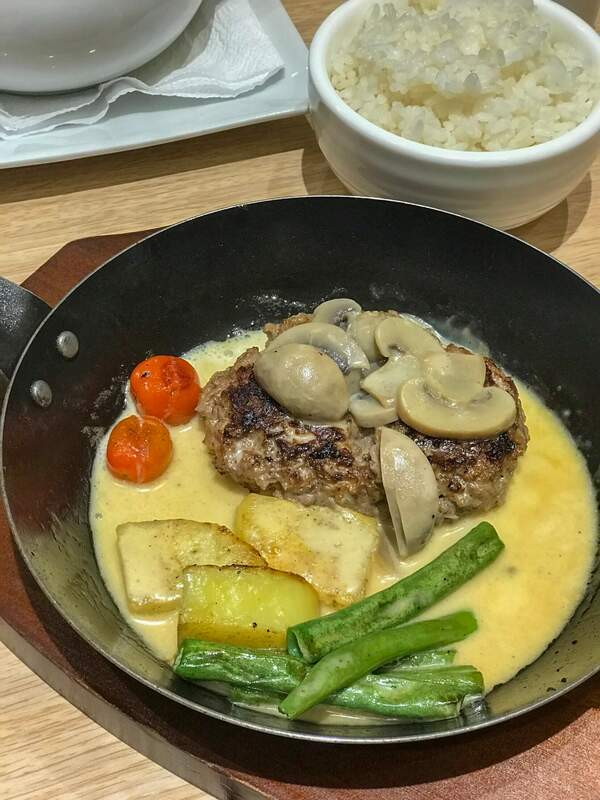 Then there are the newer offerings, which have been added since the renowned Japanese restaurant in Vertis North opened last 2016. The Beef and Shrimp Teppan rice bowls, along with the Hamburger Steak with Mushroom Gravy, are sure to keep you coming back! There are also classic ramen offerings like the Pork paitan Curry Ramen and the Soy Sauce Ramen. Both are hearty and refreshing, which is what true Japanese ramen should be. 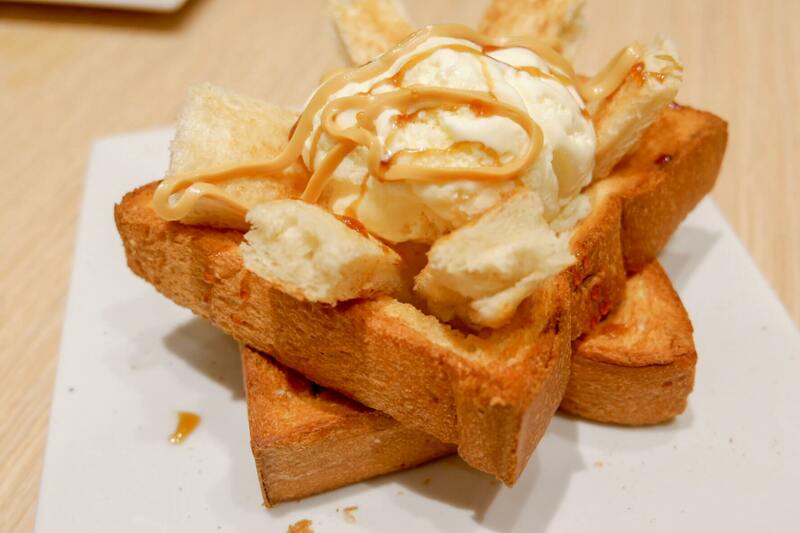 And if you want something else to fill in your carbs cravings, there’s the unforgettable Honey Toast with Brown Sugar Syrup and Creamy Kinako for dessert. This is one of those times when you would really want to eat the dessert first, but with the fine meals that should come ahead of it you would have a hard time doing just that! If ever you drop by at Vertis North and are looking to go Oriental, keep Botejyu in mind. It’s authentic, it’s divine, and its taste will remain with you for a long, long time! actually its my fav dish, few year ago i was there and this food was part of my sunday holiday. Amazing memories we had together and goes to same place to have. Thanks for sharing with us once again.